It's still the beginning of the year where people are still talking about any resolutions or goals they may have for the year. And the point of goals is to basically become a better person. A goal that a lot of people make in some form or another usually has to do with their faith. Most people (especially those that identify as Christian) usually make some kind of goal or resolution to better their relationship with God in the new year, myself included. So many people claim to follow Christ or believe in God, but how many of them actually do? I have realized over the years that most people grow up claiming to be people of faith. It's not a bad thing, but the question is, how many people really know what they believe? Or how many people even believe what they say they believe? I'm not saying this to bash on anyone for anything, but I believe that it is so important for all of us to evaluate why we believe what we do. Are we believing it because it's tradition? Because of pressure from others? Or is it because we genuinely choose to believe what we do? I think that it is so important for everyone to have their own faith and to choose what they believe. Sometimes it may line up with what your parents believe and many times it may look a little bit different. Just like how we are encouraged to explore and develop our own interests throughout adolescence and into adulthood, the same goes for your faith as well. Whatever you decide that you believe, I always encourage exploring your faith and beliefs and comparing them to what you grew up with to see what means the most to you. 1. Examine (and question!) your parents'/family's core beliefs and rituals they practice. Whether it is sitting down and thinking about how much you agree or disagree with what your parents believe or talking with your parents about what they believe (if you're comfortable doing this with them), this is the first step. Growing up, I never questioned what my parents believed (they believed different things), until one day I noticed differences in what they believed. I talked with people at my church about some of the differences in my parents' beliefs and chose what to believe for myself. There's this stigma that questioning what you believe is of the devil or something bad like that, but honestly it's not! It's good to examine what you believe, and if you are a Christian like I am, questioning doesn't always lead to becoming an agnostic or some other religion. I've questioned what I believed and my parents believed, and it has helped me figure out my faith and has made my faith stronger. 2. Read! Bibles, blogs, books, everything you can about your faith. This is not only to educate yourself, but to tie back with your parents beliefs, you can read and compare with your parents' beliefs and see for yourself what you want to believe. It's always much better to read up and learn for yourself rather than just take everyone else's word for it. 3. Explore different churches. Every church is different. As a Christian, it is so important to be in community with other people who are like-minded. Trying out different churches allows you to find where you fit depending on the style of the church, how the pastor preaches, and the people that you get to interact with. I've learned throughout the past few years that a good church is one that makes you feel comfortable to be with the people around you, but yet you always feel challenged to do better, not pressured. A good church has people who want to encourage you and love you. A good church has pastors who are real and transparent with their congregations. A good church always strives to be better. 4. Talk with others. Being in community is so important, like I said in #3. So when you go to churches or read your Bible or examine what you grew up believing, talk to other people about your journey. Find people who you can trust and that have a faith that you admire and maybe aspire to have someday. It's good to have other people that you can talk about questions and discoveries you may have along this journey. Don't forget that you are never alone. ------------------------------------ It is a new year, and so it's the perfect time to have a new goal of finding your own faith this year to differentiate yourself from the people around you. 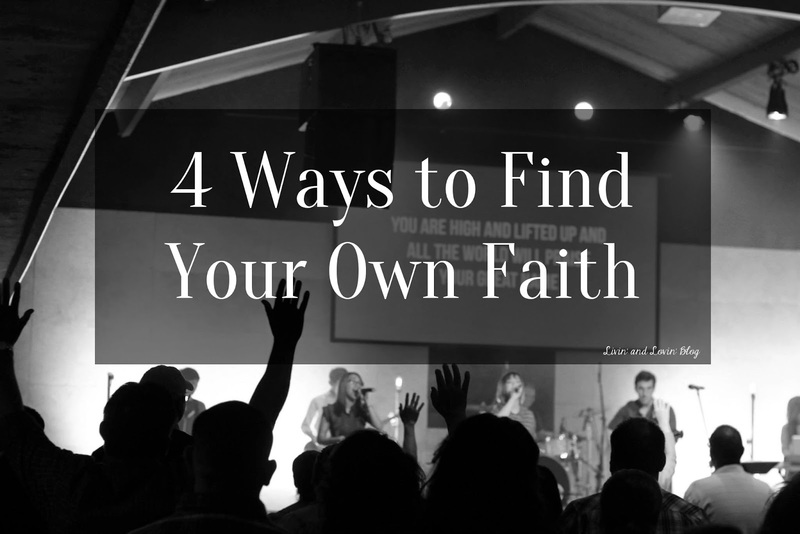 Your faith is your own, and it's so important that you have developed your own personal thoughts for it and aren't just following a crowd (or your parents). This year, I'm going to be working towards pursuing God with brand new eyes and spend time with Him. I've decided to make the word "pursue" my word of the year, and I hope you have a word for the year as well. What are your goals for your faith this year? How will you encounter God this year? I was raised (Roman) Catholic, since that's what my mother is, but for the past few years I've felt disconnected from it. I think it has to do with going away to college and being exposed to so many different religions and lifestyles. This year my personal goal is to really decide if I--as an individual, not just because of how I was raised--truly associate myself with Catholicism or something else. Great post!